As molecularly-targeted medicines are developed to supplement or replace chemotherapy and/or radiation, the driving mutations or protein expression changes in a cancer (or the surrogate biomarker indicators thereof) will need to be identifiable on a patient-by-patient basis. While key examples of "actionable mutations" do exist (eg., Herceptest for providing a basis for treatment selection), broad panels are only now being developed. 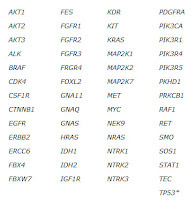 An example of a newly available test for 649 gene mutations across 53 genes is the Multiplex Solid Tumor Panel, offered at the OHSU Dept. of Pathology. The stated goal of this assay is to have "developed a panel of multiplexed assays to screen for 649 mutations across 53 genes. 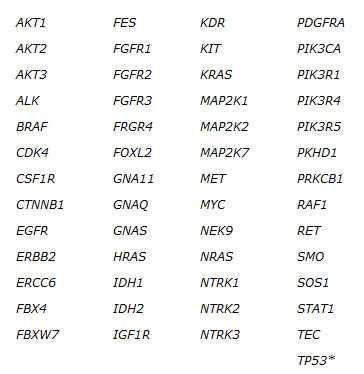 The panel is designed to facilitate rapid identification of mutations that can be targeted with therapeutics now in clinical development or already FDA-approved." Cost is approximately $2500 per patient sample. Many caveats exist as to whether such a test can be used to directly inform patient care, yet the clinical availability of this assay is a step in the right direction. [ for the peer-reviewed publication, click here for PubMed ID 21726664 (J Mol Diagn. 2011 Sep;13(5):504-13. Epub 2011 Jul 2).